Clearly a visit to Santorini is always a magical experience. The changing beauty of the island attracts admirers all year round! Apart from Santorini’s renowned sunsets and unique beaches, there are other qualities which are sure to fascinate the visitor every season of the year. The treasures of antiquity, the unique volcanic landscapes, the traditional island architecture and the distinguished culinary gems are all to be discovered come rain or shine. Santorini in spring means beauty in nature everywhere. 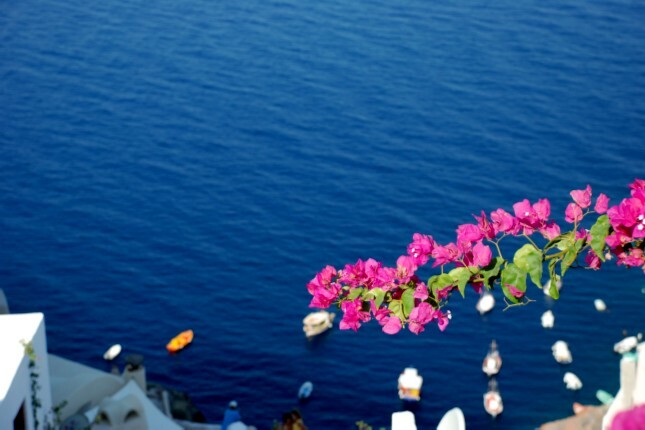 The tranquil deep blue of the Aegean Sea, the clear skies, the seductive volcanic landscape and the colorful tangles of wild flowers that bloom between the gaps in the rocks on the enchanting Caldera all once again transform the island into one of the dreamiest destinations in the world. Your choice for a tour in Santorini in spring will be well rewarded as you find yourself in front of this miracle of nature! Why Visit Santorini in Spring? Those who wonder why visit Santorini in spring will soon realize that Santorini is not only a summer destination. It is just before the influx of summer vacationers, so the pace is much slower. The beaches are practically empty, however, most establishments are open, offering many attractive off-season bargains. Local products such as seafood, fruits and vegetables are at their best, creating the delicious miracles that have made the island a culinary heaven. The island’s volcanic ash soil produces one-of-a-kind delicacies and some of the best wine on the planet! So, eat and drink as the locals do for a real gastronomic revelation! 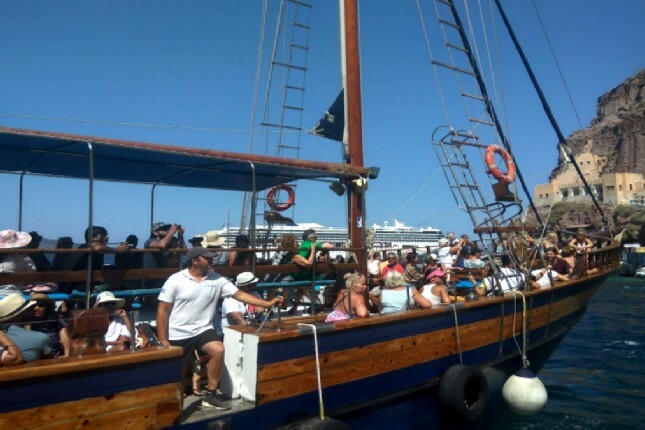 The tourist season usually begins around Easter when the island fills with Greek holidaymakers who come to enjoy the overwhelming spiritual atmosphere and to participate in the holy rituals, the ancient-old traditions and joyful celebrations. 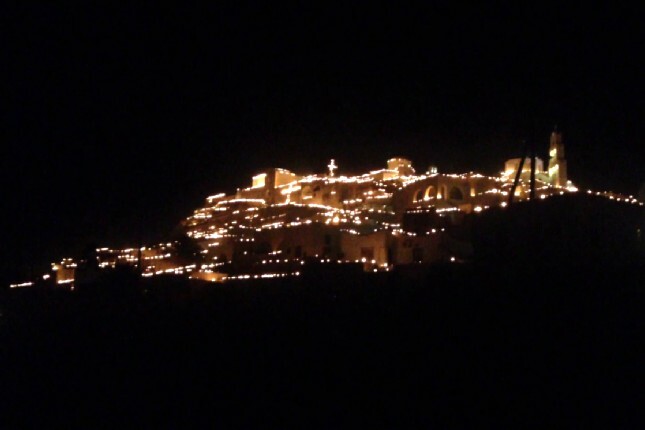 Something truly remarkable takes place on Good Friday, following the Epitaph, in the village of Pyrgos as thousands of candles and lanterns are lit up along the alleys, illuminating the whole island! Towards the end of March and beginning of April is when the cruise ships slowly begin to arrive in Santorini. 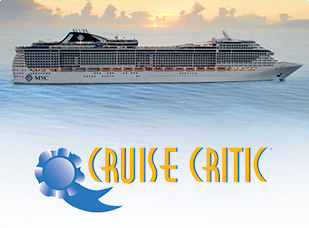 Shore excursions and exclusive Santorini private tours in spring offer cruisers the opportunity to visit all the highlights of the island while beating the summer crowds! What to Do in Santorini in Spring? You will not be short of what to do in Santorini in spring as your options are plentiful. Spring with its mild temperatures makes sightseeing quite pleasurable. 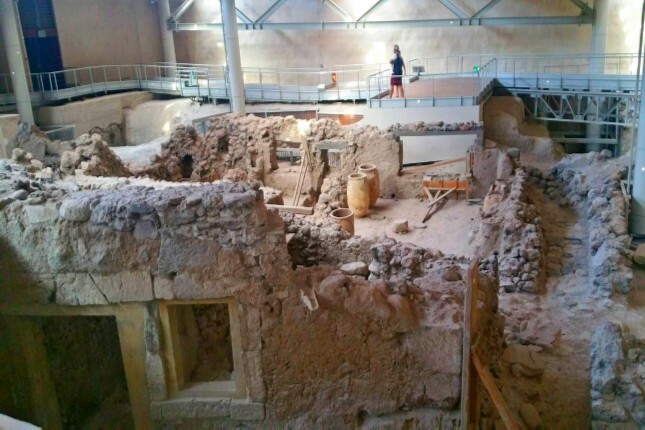 Visit the archeological site of Akrotiri, the ancient settlement which was saved from the passage of time by the volcanic ash, and learn about the captivating past of the island through the remnants of the everyday life and images. Capture unique scenes of the Red Beach, the most photographed beach on the island. Take your own Instagram-worthy pictures of this natural phenomenon without the invasion of hundreds of tourists! Tick Santorini off your bucket list with a visit to breathtaking Oia. Take a quiet stroll through the capital’s crowdless maze of white-washed houses, trendy stores and art galleries and blue-domed churches and discover that Oia is much more than a beautiful sunset! How is the Weather in Santorini in Spring? How is the weather in Santorini in spring? Perfect, with refreshingly cool evenings and beautiful warm, sunny days! Temperatures range between 13°C (56°F) to 18°C (65°F). Temperatures may be mild, however, it is wise to bring both cool and warm clothing with you as evenings can get rather chilly. In the month of April, you may even opt for a dip in the sea, although the waters might still be slightly cold, so don’t forget your swimsuit! Santorini in summer is for lovers; lovers of the warm weather and the unique beaches found only here and nowhere else! The seascapes and landscapes on your Santorini Island tour will literally take your breath away. Visit Santorini in summer and walk into a dreamy summer scene of your favorite travel magazine. Why Visit Santorini in Summer? Santorini all year round is spectacular! So, why visit Santorini in summer? To enjoy the warm weather activities, the happening beach life and all that this marvelous Aegean island has to offer to the fullest! Also, as most can only take the time to travel to Santorini in the summer months, the island becomes a hotspot for curious tourists, cheerful families with children and even solo travelers out on a Greek island adventure. 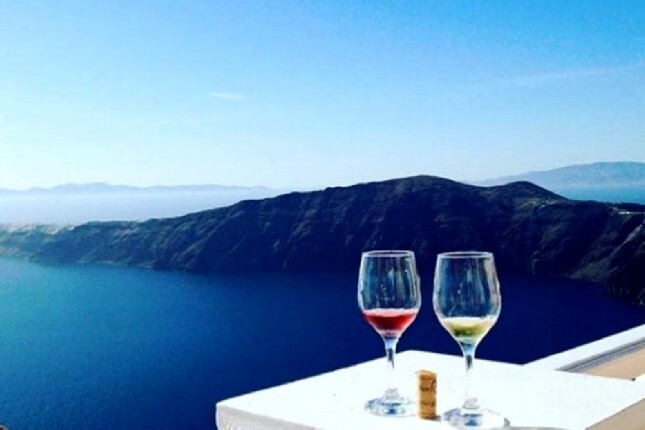 Summer is the best season to visit Santorini for all the wine lovers out there! The cutting of the first bunch of Assyrtiko in August signals the beginning of the wine grape harvest. 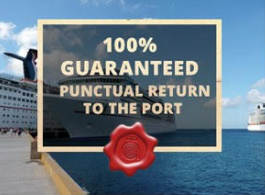 The island is also a popular port of call on cruises in the Eastern Mediterranean and is considered the very best Greek islands to visit. Therefore, in summer, cruise ships with thousands of passengers visit the island daily making it the busiest season of the year. What to do in Santorini in Summer? What to do in Santorini in summer will never be an issue as your choices are endless! There is something for everyone, depending on your interests. Top on everyone’s Santorini Island tour list is beach hopping! Santorini Island offers some of the most unique beaches in the Cyclades. 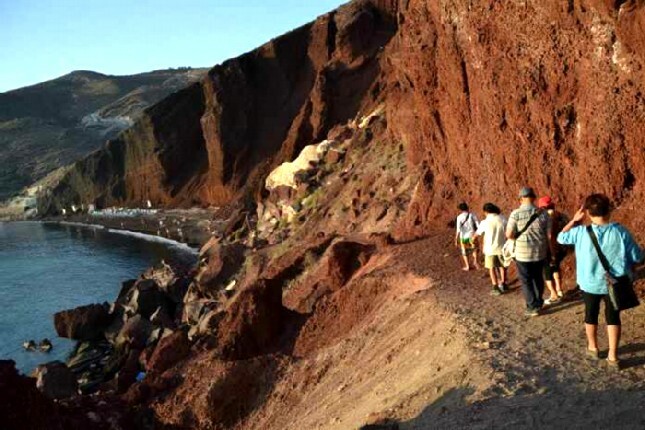 The Red Beach is one of the most captivating beaches on the island with its scarlet-colored sand and rocky cliffs. 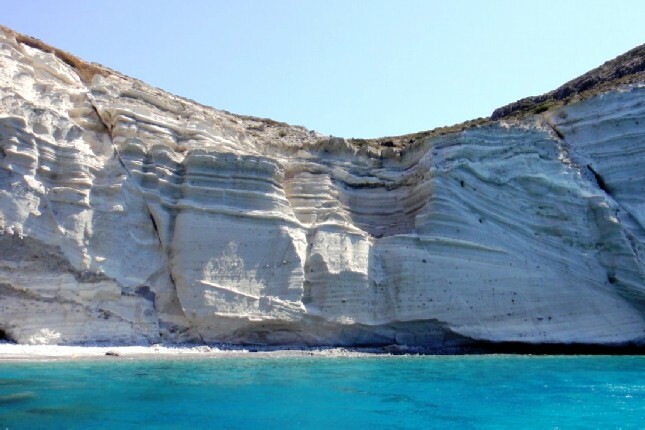 The towering white cliffs of the White Beach offer a remarkable contrast to its black pebble shoreline. It remains quiet, even in the summer months, due to its isolated location, creating an ideal spot to relax and enjoy some time away from the crowds. 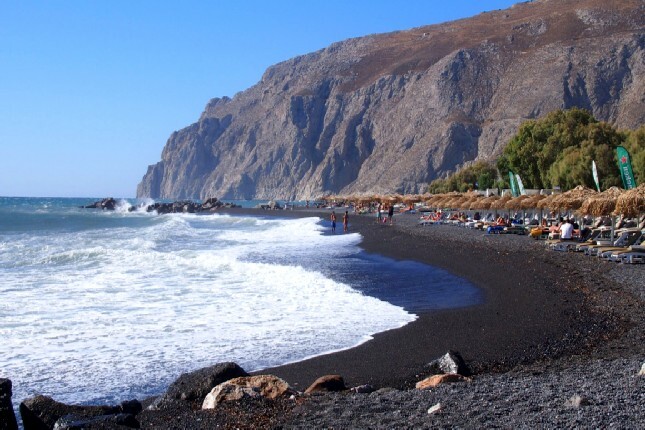 The Black Beach of Kamari is a fully-organized beach covered with black sand. It offers amenities, such as sunbeds, umbrellas, water sports and a lifeguard, making it especially popular with families with children. Along the waterfront, there are various shops, restaurants, tavernas and cafes. 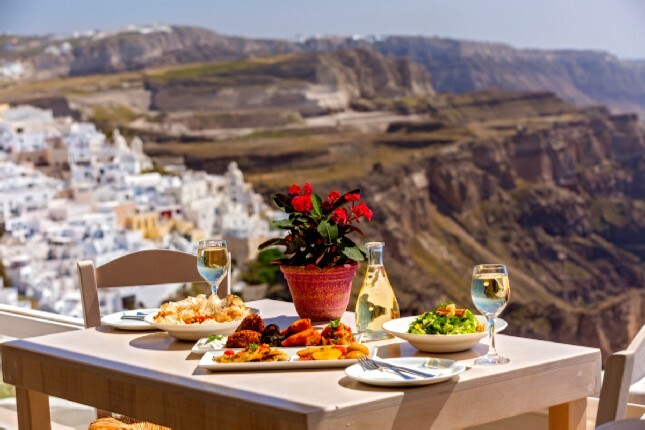 In recent years, Santorini wine has made a name for itself all over the world, and that name is well deserved! 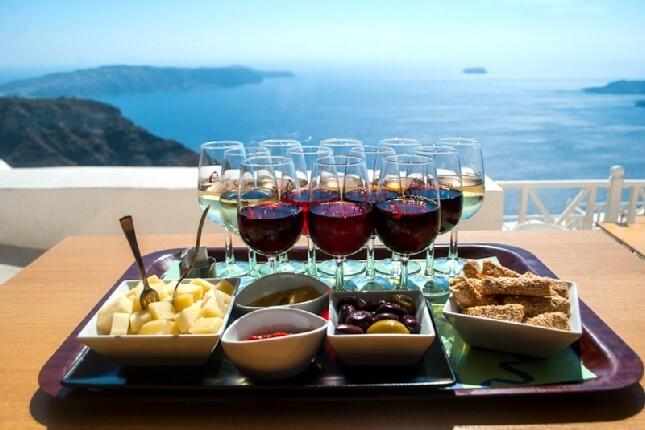 On a Santorini wine tour of the island’s’ awarded wineries you can participate in an exhilarating wine tasting of Santorini wines while enjoying the jaw-dropping views! Tingle your taste buds with a tasting experience of the unique grape varieties in the region under the guidance of wine experts. Visit one of Santorini’s oldest vineyard and learn about the traditional process of winemaking and all there is to know about the wine culture of the island that dates back to ancient years. How is the Weather in Santorini in Summer? There is really no need to ask how is the weather in Santorini in summer. Just about everyone knows it is hot! Temperatures range between 23°C (74°F) to 38°C (100°F). Almost continuous sunshine attracts large numbers of visitors. With temperatures this high, you won't need to bring anything but your swimsuit, plenty of sunscreen and a hat. The best time to visit the Greek islands, like Santorini, is in fall when the weather is still warm and the crowds are few. It is the perfect time to take in all that the sense-rousing magic the island of Santorini has aplenty. Santorini in fall is the time to fall in love with one of the most romantic destinations in the world! Why Visit Santorini in Fall? Santorini, the dramatic queen of the Cyclades, gives her best performance with the coming of fall. Those who have visited Santorini in fall have experienced that amazing beauty in the change of scenery, the passing fog climbing up the cliffs high above the sea and traveling through the alleys, and the open unobstructed gazing at the color-filled horizon. It’s an amazing feeling that gives birth to awe, peace and respect for this unique landscape. What to Do in Santorini in Fall? 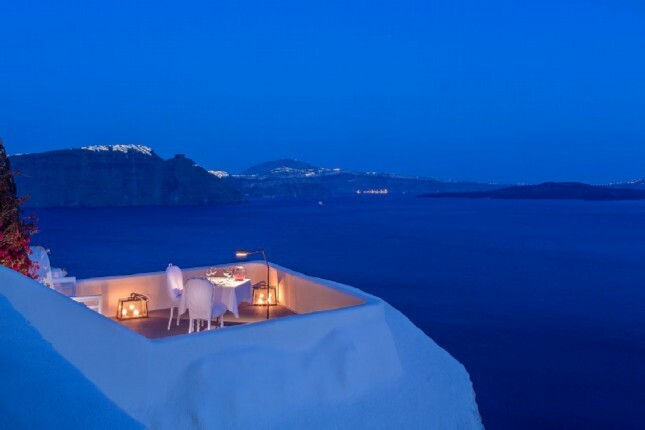 Many hotels, shops and restaurants in Santorini remain open all year round. You can access all the major sights without jostling crowds of people for the best sunset views. 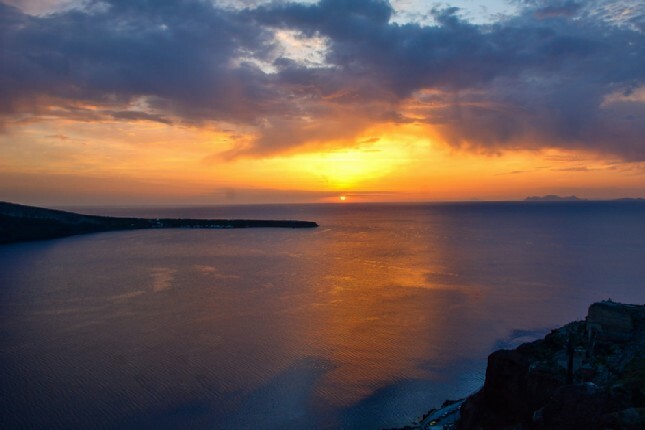 But if you think the sunset views in summer are awesome, then you haven’t seen the sunset in Santorini in fall - it’s epic! 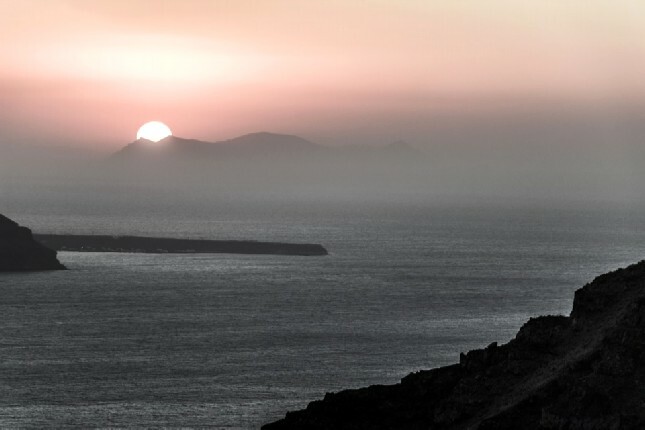 Santorini is blessed with magical walking trails that connect villages to mountain chapels and windswept dramatic sea coasts with views over the Aegean Sea. 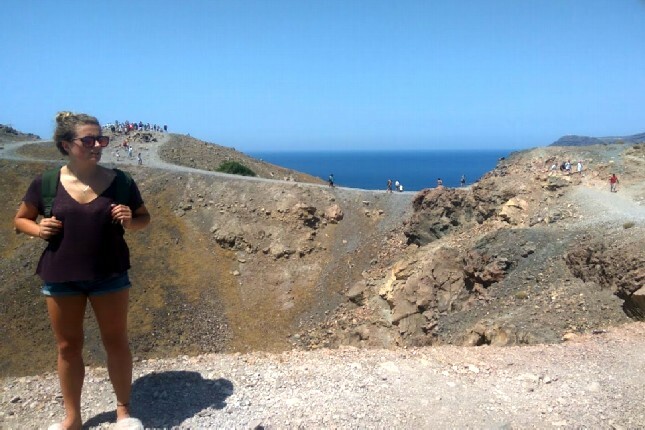 But the most talked about trek in Santorini is that which goes from the picturesque port of Fira and follows the rim of the caldera until Oia. The hike is especially sensational in fall as you witness the sparkling, azure Aegean Sea stretching for miles before your eyes. One of the best activities to do in Santorini in fall is to take a romantic quiet tour of the Santorini volcano and the hot springs. You set sail from the old port of Fira to the harbor of Erinia, at Nea Kameni, in a wooden sailing boat. 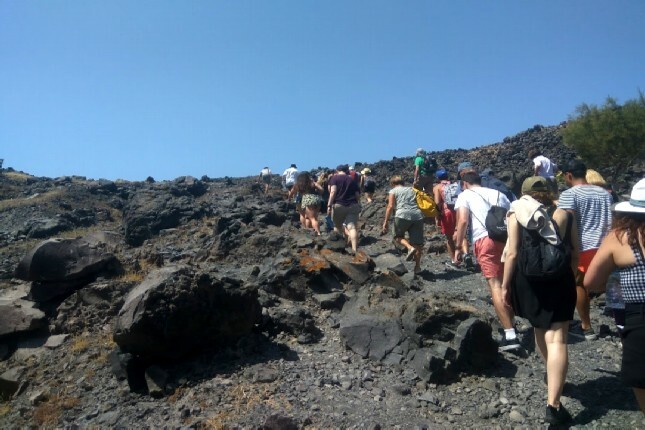 Follow the path to the top where active craters of the volcano are but make sure to wear sturdy shoes and bring a bottle of water. 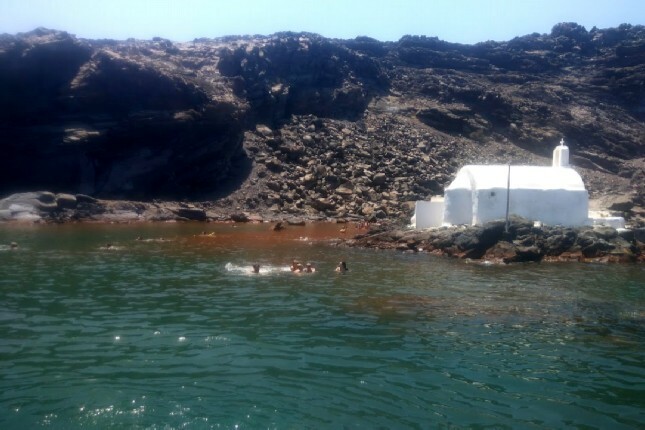 Dive into the thermal sulphur waters in the small bay of Agios Nikolaos off the island of Palea Kameni. The hot springs and famous mud baths here were formed as a result of volcanic eruptions while the water temperatures range between 30°C (86°F) to 35°C (95°F), as it mixes continuously with the normal sea currents. How is the Weather in Santorini in Fall? The weather in Santorini in October is superb! 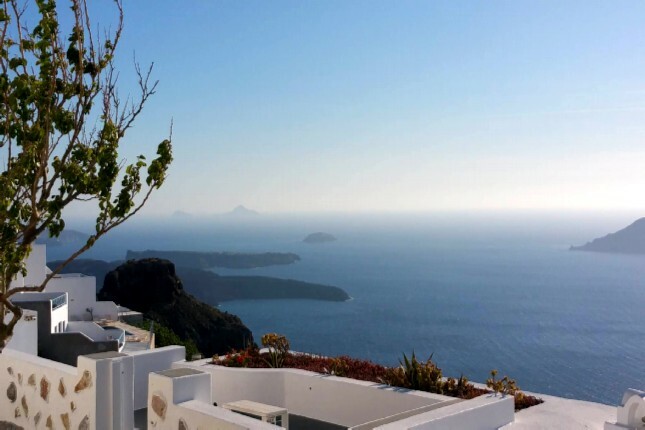 Temperatures are pleasantly mild, however, as winter season is just around the corner, the weather in Santorini in fall starts to get chilly in the evenings. Temperatures in Santorini in fall range between 14°C (57°F) to 23°C (73°F). Warm clothing, such as a thin coat or jacket and long trousers are recommended. It's a good idea to bring a swimsuit, sunscreen and a hat, just in case the weather is still warm and you’d like to go for a swim. Santorini Island seems to always be full of light. In winter, it is still there, bright as always but sweeter. Santorini in winter rejuvenates the season’s colors, while the mild temperatures revive the desire for exploration. If you believe that Santorini’s journey through the winter months is in solitude, reminiscing the active summers, the time has come to learn the opposite. Why Visit Santorini in Winter? The mention of Santorini Island brings up images of fun-packed beaches and sparkling deep blue waters under sun-drenched skies. However, the reality is that Santorini in winter offers some of its top features outside the tourist-crazed summer season. Winter on Santorini is all about wonderful walks with open vistas, uncrowded archaeological sites and museums and bustling island life. So, bust your stereotypes and see Santorini as the locals do. Wintertime island life becomes something quite exceptional. Welcoming locals make for interesting, pleasant visits. Changing light conditions and moody skyscapes make walking a magnificent, dramatic activity. October through December is olive harvest season; drop in at a local olive press to see it in action. 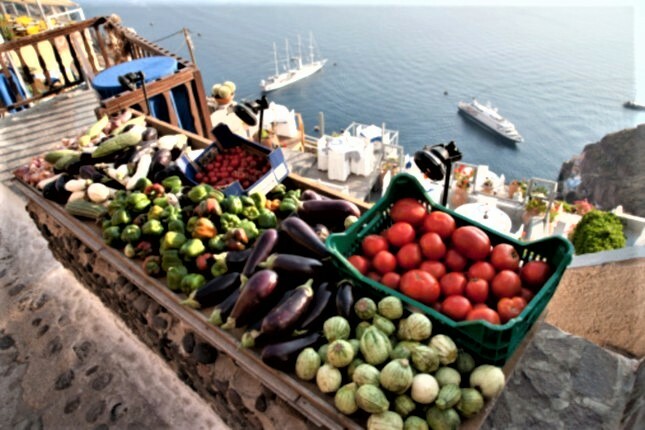 All the larger Greek Islands like Santorini have some of the best local cuisines in the country, with fresh local products and original recipes. What to Do in Santorini in Winter? Winter is by far the best time to visit Santorini’s archaeological sites and museums, some of the most significant in the world and the veritable foundations of western civilization. These are virtually deserted, compared to the crowded summer months. Santorini’s rich lode of Minoan past is evident at the Archeological Site of Akrotiri, which remains open to the public throughout the year. The lesser-visited ruins of Ancient Thira date back to the 3rd century BC. These terraced ruins are located on the mountain overlooking the Aegean Sea, between the Black Beach of Kamari and Perissa Beach. They are best visited in winter as the sun tends to get too hot in the summer months. Many of the artifacts found in Ancient Thira and Akrotiri can be found in the Historical and Cultural Archeological Museum of Santorini in Fira. Have the picturesque village of Oia practically to yourself! Discover the hidden gems that remain open like the Atlantis Books Bookstore. Dubbed one of the “best bookstores in the world”, Atlantis is a tiny underground cave on the main road of the village. As their winter hours are varied, make sure to knock on the door if you find it closed. Someone is sure to open. Fira is the main hub and the most active town in Santorini in winter. Many restaurants, pubs and cafes are located here. Your choices might be limited, but there are more than enough. And yes, there are people walking around, however, with no cruise ships coming in, it is rather quiet. In winter, it’s crazy easy to meet the locals and make new friends. 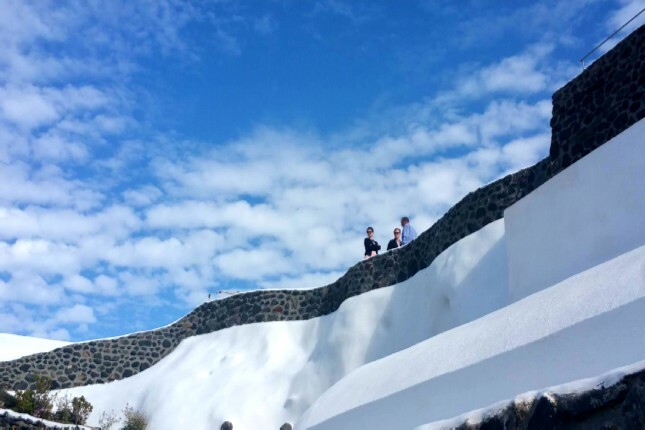 Hence, experience Santorini in winter and experience Santorini island life to the fullest! How is the Weather in Santorini in Winter? Of course, the next obvious question is, “How is the weather in Santorini in winter?” Temperatures in Santorini in winter range between 11°C (52°F) to 15°C (59°F). Despite the cool temperatures and decrease in sunshine hours, Santorini is still pleasant, making it a wise choice for your winter vacation destination. Warm clothing, such as a thick coat or jacket and long trousers are recommended. There is always a fair possibility of rainfall, so bring a raincoat or an umbrella, just in case. No matter the season or the weather, you are sure to have a great time in Santorini. The best season to visit the island really depends on what you’re looking for. Visit Santorini all year round and discover its beauty every season of the year! 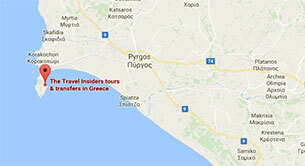 Find the best Santorini Island tour that suits your personal preference from the list below and… start packing!